Dracaenas are generally rugged, carefree houseplants with a robust and tropical appearance. They are widely used for both home and office plantings. Many tolerate low light conditions. The ‘Janet Craig’ Dracaena (Dracaena deremensis ‘Janet Craig’) can grow up to ten feet tall. Dracaenas can grow 2 to 10 feet tall, depending on the cultivar. It is easy to maintain these plants at shorter heights if desired. Upright types will usually be no more than 2 feet wide. Dracaenas are grown for their strap-shaped foliage which is colorfully striped in many of the cultivars. In the home, plant diseases are very rarely a problem. Too much or too little water plus insects and mites are the main problems. Root rot usually results from a soil mix that does not drain quickly or overly frequent watering. Scale insects and mites are the most common insect pests of dracaena. Dry tips and edges are usually caused by too little humidity. 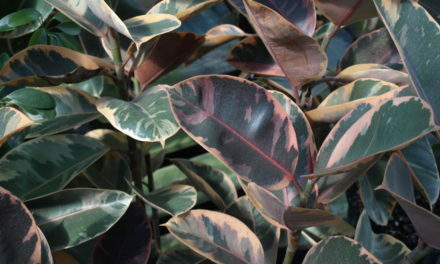 Round dry patches and streaks on the leaves may be caused by excessive sunlight on the foliage. A sudden loss of many leaves can be caused by changes in temperature, drafts, too much water, poor drainage or heavy insect infestations. Leaf tips and margins may burn or become yellow if plants are fertilized too heavily. Dracaena is very sensitive to fluoride. Symptoms include yellowing of the tips or margins of the leaf or dead, scorched areas. Avoid potting soils that have a high percentage of perlite and keep the soil pH between 6.0 and 6.5 to prevent fluoride from causing injury. Do not use fertilizer which contains superphosphate since it often has high levels of fluorine. Most dracaenas grow best in bright, indirect light, but many are also tolerant of lower light. If a plant that has been growing in dim light is moved to a brighter spot, the new leaves will be thicker and stronger and growth rate will increase. Allow dracaenas to dry slightly between waterings. Wait until the soil surface is dry to the touch, then water them thoroughly. Avoid watering with cold water. Dracaenas are best grown in normal house temperatures of 60 to 70 °F during the day. Ideally, night temperatures should be about 10 °F cooler. If the humidity in the house is below 30 to 40 percent (it probably is during winter), plants will benefit from an occasional misting of their foliage. A standard commercial houseplant potting mix may be used. Feed dracaenas with liquid foliage plant fertilizer once a month during the spring and summer months. Time release fertilizer pellets may be used also. If the plant’s stems become too long and bare, cut them off at the desired height and new leaves will soon appear. Corn Plant (Dracaena fragrans): The common name comes from the appearance of the leaves, which resemble sweet corn. The ‘Massangeana’ Dracaena (Dracaena fragrans ‘Massangeana’) is the most commonly grown cultivar. ‘Massangeana’ is the most commonly grown cultivar. Its glossy green, arching leaves have a wide central stripe of yellow. The plants grow 4 to 5 feet tall with a 2-foot spread on stout tan stems. ‘Lindenii’ has edge stripes of creamy white. ‘Rothiana’ has leathery leaves with white edges. Dragon Tree (Dracaena marginata): Thin stems are topped by clusters of slender arching leaves with narrow purple margins. The stems often have interesting natural bends. Some people also train bends by setting the plant on its side for some time. Dragon trees can grow up to 10 feet tall. Cut back the stems to force the plant to branch. The dragon tree is widely used in home, office and commercial decor because it tolerates low light. ‘Tricolor’ has cream and red stripes on narrow green leaves that are responsible for the name of this popular cultivar. Gold Dust Dracaena (Dracaena godseffiana): This small dracaena is shrub like in appearance. It grows 2½ feet tall with 3-to 4-inch long leaves spiraled around thin-wiry stems. 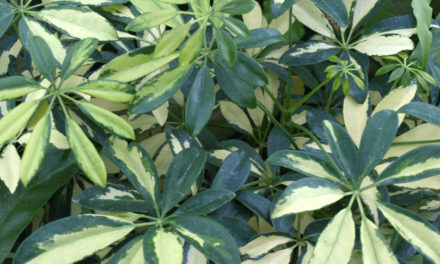 The leaves are liberally speckled creamy yellow that fades to white as the leaves mature. One of the best variegated plants for low light is the ‘Warneckii’ Dracaena (Dracaena deremensis ‘Warneckii’). 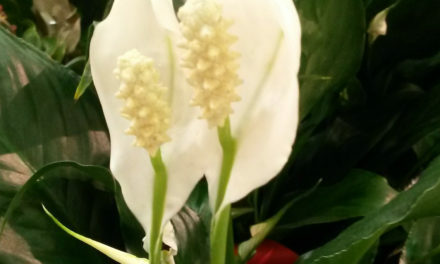 ‘Florida Beauty’ has so much yellow or white on its leaves that little green is visible. Green Dracaena (Dracaena deremensis): The species is far less common than its widely grown cultivars. ‘Janet Craig’ is widely used in home and commercial interior landscaping. It has wide, dark, glossy green leaves that are held in graceful arches along thick stems. It can grow up to 10 feet tall. ‘Compacta’ has 5-inch long leaves tightly clustered along slow-growing stems. 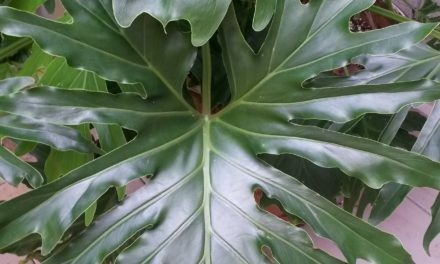 ‘Bausei’ has 18 inches long leaves that are 2 inches wide on stems that grow to 4 feet tall. There is a single, broad white stripe along the middle of each leaf. ‘Warneckii’ is one of the best variegated plants for low light. ‘Warneckii’ has white-striped leaves and grows to 4 feet tall. Pleomele (Dracaena reflexa): This dracaena has flexible stems. Short, dense leaf rosettes spiral around the stems. Foliage will stay dense to the base if this plant is grown with enough light.